On Thursday September the 10th a blur of Lycra clad cyclists whizzed past the entrance to Aira Force. The Tour of Britain had come to town. 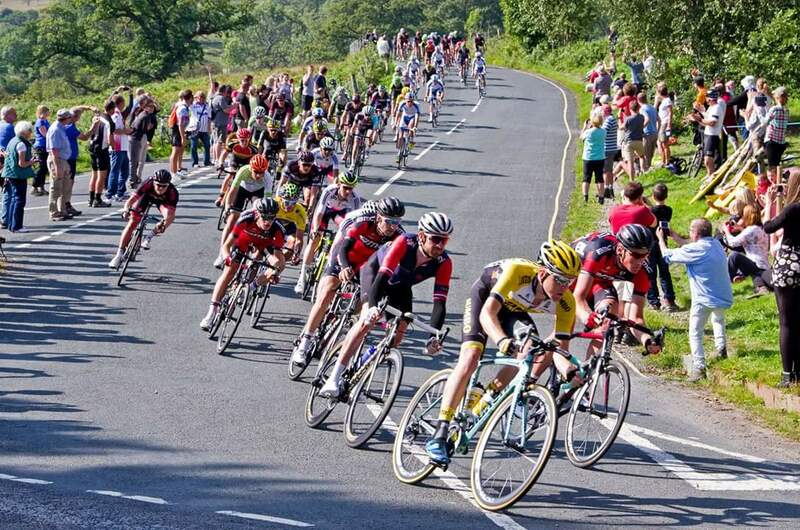 The Tour of Britain’s origins are believed to date back to just after the Second World War. The event has grown and grown ever since. 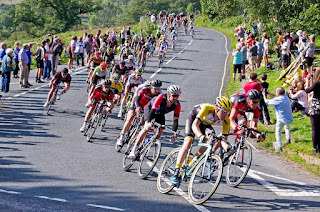 This year saw competitors such as 2012 Tour De France winner Sir Bradley Wiggins and Mark Cavendish winner of 26 Tour De France stages, taking part. 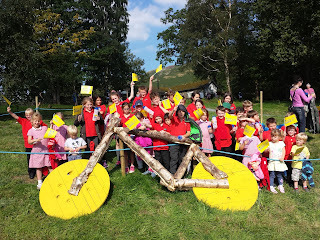 With two of the eight stages starting or ending in Cumbria the locals had really gone to town in decorating road side verges, trees, gardens and anywhere else they could think of to place what has become a local landmark, of bikes that had been painted yellow. It was decided here at Aira Force we needed to enter into the spirit. So in keeping with the ethos of naturally made items, we thought we would make a bike out of some leftover timber we had in the yard. I wonder if Sir Bradley could have won the Tour De France on this!!!? The bike being secured into position. On the day of the race the sun came out and the local primary school came down to cheer on their favourite cyclists. The 120 or so competitors shot past in the blink of an eye. Overall it was a great day enjoyed by all. And if you look closely enough on the highlights, you can just about pick out the yellow wheels of the bike as the helicopter shot pans down Ullswater. Working Holiday Group at Millerground. This post is in recognition of the invaluable help we received from the Working Holiday Group who were with us between the 6th and 11th of September at Millerground and for half a day at St. Catherine's. The main gateway to Millerground. National Trust land at Millerground is one of the few public access points to Windermere's eastern shore. It is extremely popular, especially as it is within easy reach of the nearby towns of Bowness and Windermere. Millerground is at the base, on its west side, of a large drumlin known as Queen Adelaide's Hill. Drumlins are elongated hills formed from glacial deposits. This glacial till or moraine consists largely of gravel and, as a result, is very soft and easily eroded. When lake levels are high, and especially during Winter storms these banks, consisting of glacial till, are all too easily undermined by strong wave action, putting the raised lake shore footpath at risk. To combat this, the undermined areas are filled in with stone and then larger stone is pitched at an angle to protect the repaired area. See below. With the help of the recent working holiday group the last 'at risk' sections have now been repaired and barring extreme Winter storms should now be good for many years to come. Queen Adelaide's Hill, above Millerground... formed by a glacier. Members of the working holiday group are seen here collecting both smaller stones for filling in the undermined areas, and larger stones for the revetment or stone pitching work. This shows an undermined area in the process of being repaired. If left for too much longer the footpath above would be compromised by being undercut. Another section well on the way to completion. The surface of the footpath was upgraded in several places with several tons of resurfacing material..MOT road-stone. A lot of blind or partially sighted pedestrians use this path. The new surface being raked in. We were lucky with the weather; the mist from temperature inversions gave way to sunshine for most of the week. On the Wednesday, the working holiday group had a day off and took to the water with Windermere Outdoor Adventure who have a base at Millerground. Here, Lee is giving instructions and a safety talk. Paddling due south. Wednesday was the only overcast day! The group stopped at Cockshott Point to stretch their legs and have a chat with the fell rangers who are working on a major lake-shore revetment project there. A stop in-front of some of the revetment work completed the day before at Millerground! Later in the day the group went sailing. The sails ready to be hoisted. On the Friday, 2000 bulbs were planted at St. Catherine's. Mission accomplished! Group photo by the 'Spirit of Place' Sculpture at St. Catherine's. Netted Carpet Moth Survey. (East Windermere) 2015. The netted carpet moth is one of our rarest moths; its caterpillars or larvae depend on touch-me-not balsam, a 'nationally scarce' annual plant. It is their only food source. The Netted Carpet Moth (Eustroma Reticulatum) is classified as vulnerable in the Red Data Book and listed as a priority species by the UK Biodiversity Action Plan. Its main stronghold is within the Lake District. Touch-Me-Not Balsam (Impatiens Noli-Tangere) with larvae in late August. Caterpillars pupate in the ground by October. Adults emerge in July and are 'on the wing' until mid August. The females lay eggs singly on the underside of the plant's leaves. 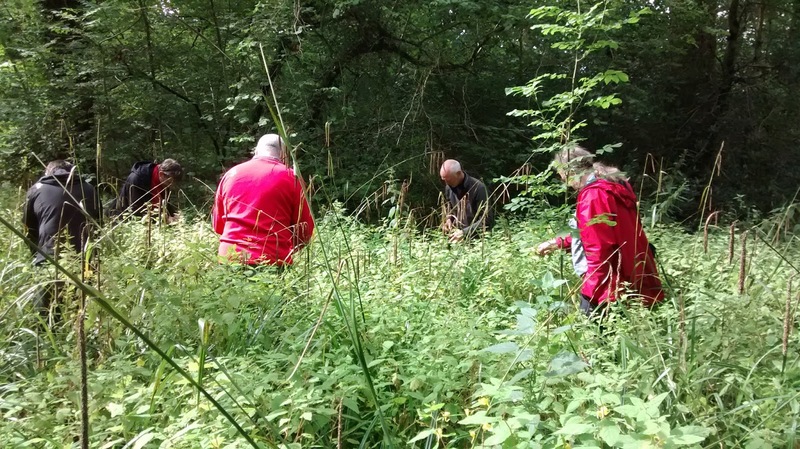 Since 1990 larval count surveys have been undertaken by Dr. Paul Hatcher of Reading University and John Hooson, National Trust Wildlife and Countryside Adviser, with help from Trust staff and volunteers. The fifth Quinquennial Survey started out at St. Catherine's near Windermere on September 2nd. and then covered the other East Windermere sites. A caterpillar about to be photographed on touch-me-not at St. Catherine's by Academy Ranger, Pete. The cool summer has delayed the caterpillars growth and development; many were exceptionally small and incredibly hard to spot. The larvae go through four stages of growth known as instars before they pupate. Usually by September the larvae are on their third or fourth instar. The one in the image is only on its first! 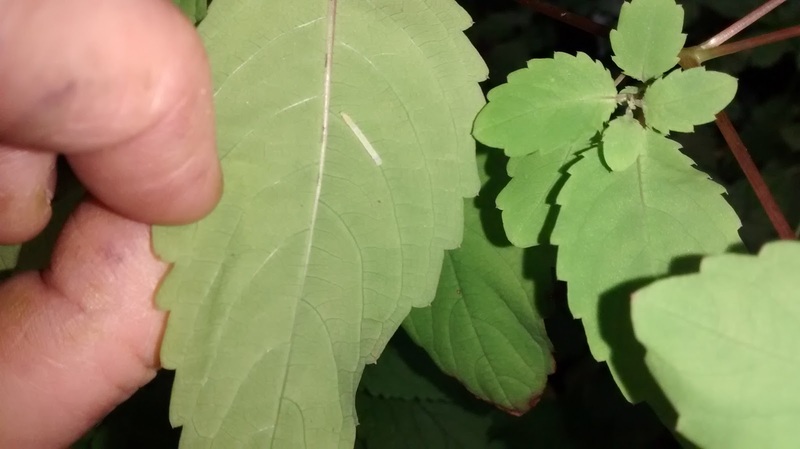 A rare find was this caterpillar on its third or fourth instar! No Caterpillars were found at the Hodge Howe Wood site in spite of an intensive search! Sadly, none were found at this large stand of touch-me-not, a previously unrecorded site. Success! A caterpillar on the underside of a balsam leaf at the Birthwaite Road site. A rare and unusual image of my clean fingernails! Seriously, it is showing a small larvae lunching on a small touch-me-not seed pod or capsule. YIKES! This large caterpillar is the larvae of the elephant hawk moth and they are occasionally seen on touch-me-not. More often they are to be seen on willow herb. Once the rest of the known sites have been surveyed an estimate of the current UK populations can be arrived at; this will give an indication of how well the netted carpet moth is doing. 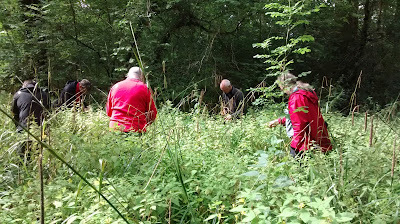 Related posts to this one are on this blog and tell the story of National Trust's rangers' conservation work involving the moth and the plant.